Celecoxib is a COX-2 selective nonsteroidal anti-inflammatory drug (NSAID). It is used to treat the pain and inflammation of osteoarthritis, rheumatoid arthritis, ankylosing spondylitis, acute pain in adults, painful menstruation, and juvenile rheumatoid arthritis in people two years or older. Side effects include a 37% increase in incidence of major vascular events, which include nonfatal myocardial infarction, nonfatal stroke, or death from a blood vessel-related cause. Additionally, an 81% increase in incidence of upper gastrointestinal complications occurs, which include perforations, obstructions, or gastrointestinal bleeding as in all NSAIDs. It is marketed by Pfizer under the brand names Celebrex and Celebra for arthritis and Onsenal for polyps. Celecoxib is available by prescription in capsule form. Celecoxib is used for osteoarthritis, rheumatoid arthritis, acute pain, painful menstruation, ankylosing spondylitis, and to reduce the number of colon and rectal polyps in people with familial adenomatous polyposis. It may also be used in children with juvenile rheumatoid arthritis who are older than two years of age and weigh more than 10 kg (22 lb). For postoperative pain, it is more or less equal to ibuprofen. For pain relief, it is similar to paracetamol (acetaminophen). And in osteoarthritis acetaminophen is the first line treatment for OA. It was originally intended to relieve pain while minimizing the gastrointestinal adverse effects seen with conventional NSAIDs. In practice, its primary use is in people who need regular and long-term pain relief; probably, no advantage exists to using celecoxib for short-term or acute pain relief over conventional NSAIDs, except in the situation where nonselective NSAIDs or aspirin cause cutaneous reactions (urticaria or "hives"). Tentative evidence indicates its use in treating a number of psychiatric disorders, including major depression, bipolar disorder, and schizophrenia. It has been used to reduce colon and rectal polyps in people with familial adenomatous polyposis, but it is not known if it decreases rates of cancer, so it is not a good choice for this reason. The coxibs (which includes celecoxib) increase the risk of major cardiovascular problems by about 37%. Naproxen does not significantly increase the rate of major vascular events. 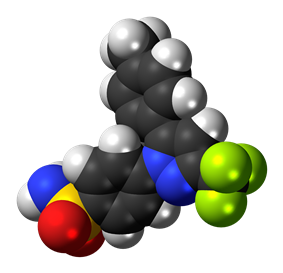 The COX-2 inhibitor rofecoxib (Vioxx) was removed from the market in 2004 due to its risk. Like all NSAIDs on the US market, celecoxib carries an FDA-mandated "black box warning" for cardiovascular and gastrointestinal risk. In February 2007, the American Heart Association warned that with respect to "patients with a prior history of or at high risk for cardiovascular disease... use of COX-2 inhibitors for pain relief should be limited to patients for whom there are no appropriate alternatives, and then, only in the lowest dose and for the shortest duration necessary." Cardiovascular effects of COX-2 inhibitors differ, depending on the drug. Other COX-2-selective inhibitors, such as rofecoxib, have significantly higher myocardial infarction rates than celecoxib. In April 2005, after an extensive review of data, the FDA concluded it was likely "that there is a 'class effect' for increased CV risk for all NSAIDs". In a 2006 meta-analysis of randomized control studies, the cerebrovascular events associated with COX-2 inhibitors were examined, but no significant risks were found when compared to nonselective NSAIDs or placebos. Celecoxib is predominantly metabolized by cytochrome P450 2C9. Caution must be exercised with concomitant use of 2C9 inhibitors, such as fluconazole, which can greatly elevate celecoxib serum levels. If used concomitantly with lithium, celecoxib increases lithium plasma levels. If used concomitantly with warfarin, celecoxib may result in increased risk of bleeding complications. The drug may increase the risk of kidney failure with angiotensin-converting enzyme-inhibitors, such as lisinopril, and diuretics, such as hydrochlorothiazide. In the US FDA's pregnancy categories, the drug is category C prior to 30 weeks gestation, and category D starting at 30 weeks gestation. A highly selective reversible inhibitor of the COX-2 isoform of cyclooxygenase, celecoxib inhibits the transformation of arachidonic acid to prostaglandin precursors. Therefore, it has antipyretic, analgesic and anti-inflammatory properties. Nonselective NSAIDs (such as aspirin, naproxen, and ibuprofen) inhibit both COX-1 and COX-2. Inhibition of COX-1 (which celecoxib does not inhibit at therapeutic concentrations) inhibits the production of prostaglandins and the production of thromboxane A2, a platelet activator. COX-1 is traditionally defined as a constitutively expressed "housekeeping" enzyme and plays a role in the protection of the gastrointestinal mucosa, kidney hemodynamics, and platelet thrombogenesis. COX-2, on the contrary, is extensively expressed in cells involved in inflammation and is upregulated by bacterial lipopolysaccharides, cytokines, growth factors, and tumor promoters. Celecoxib is approximately 10-20 times more selective for COX-2 inhibition over COX-1. It binds with its polar sulfonamide side chain to a hydrophilic side pocket region close to the active COX-2 binding site. In theory, this selectivity allows celecoxib and other COX-2 inhibitors to reduce inflammation (and pain) while minimizing gastrointestinal adverse drug reactions (e.g. stomach ulcers) that are common with nonselective NSAIDs. The Searle research group found the two appropriately substituted aromatic rings must reside on adjacent positions about the central ring for adequate COX-2 inhibition. Various modifications can be made to the 1,5-diarylpyrazole moiety to deduce the structure-activity relationship of celecoxib. A para-sulfamoylphenyl at position 1 of the pyrazole was found to have a higher potency for COX-2 selective inhibition than a para-methoxyphenyl (see structures 1 and 2, below). In addition, a 4-(methylsulfonyl)phenyl or 4-sulfamoylphenyl is known to be necessary for COX-2 inhibition. For instance, replacing either of these entities with a –SO2NHCH3 substituent diminishes COX-2 inhibitory activity as noted with a very high inhibitory concentration-50 (see structures 3 - 5). At the 3-position of the pyrazole, a trifluoromethyl or difluoromethyl provides superior selectivity and potency compared to a fluoromethyl or methyl substitution (see structures 6 – 9). Celecoxib is compound 22; the 4-sulfamoylphenyl on the 1-pyrazol substituent is required for COX-2 inhibition and the 4-methyl on the 5-pyrazol system has low steric hindrance to maximize potency, while the 3-trifluoromethyl group provides superior selectivity and potency. To explain the selectivity of celecoxib, it is necessary to analyze the free energy of binding difference between the drug molecule and COX-1 compared to COX-2 enzymes. The structural modifications highlight the importance of binding to residue 523 in the side binding pocket of the cyclooxygenase enzyme, which is an isoleucine in COX-1 and a valine in COX-2. This mutation appears to contribute to COX-2 selectivity by creating steric hindrance between the sulfonamide oxygen and the methyl group of Ile523 that effectively destabilizes the celecoxib-COX-1 complex. Thus, it is reasonable to expect COX-2-selective inhibitors to be more bulky than nonselective NSAIDs. Two lawsuits arose over discovery of celecoxib. Daniel L. Simmons of Brigham Young University discovered the COX-2 enzyme in 1988, and in 1991 BYU entered into a collaboration with Monsanto to develop drugs to inhibit it. Monsanto was later purchased by pharmaceutical company Pfizer, and in 2006 BYU sued Pfizer for breach of contract, claiming Pfizer did not properly pay contractual royalties back to BYU. A settlement was reached in April 2012 in which Pfizer agreed to pay $450 million. Other important discoveries in COX-2 were made at University of Rochester, which patented the discoveries. When the patent issued, the university sued Searle (later Pfizer) in a case called, University of Rochester v. G.D. Searle & Co., 358 F.3d 916 (Fed. Cir. 2004). The court ruled in favor of Searle in 2004, holding in essence that the university had claimed a method requiring, yet provided no written description of, a compound that could inhibit COX-2 and therefore the patent was invalid. After the withdrawal of rofecoxib from the market in September 2004, Celebrex enjoyed a robust increase in sales. However, the results of the APC trial in December of that year raised concerns that Celebrex might carry risks similar to those of rofecoxib, and Pfizer announced a moratorium on direct-to-consumer advertising of Celebrex soon afterwards. After a significant drop, sales of Celebrex have recovered, and reached $2 billion in 2006. Pfizer resumed advertising Celebrex in magazines in 2006, and resumed television advertising in April 2007 with an unorthodox, 2 1⁄2-minute advertisement which extensively discussed the adverse effects of Celebrex in comparison with other anti-inflammatory drugs. The ad drew criticism from the consumer advocacy group Public Citizen, which called the ad's comparisons misleading. Pfizer responded to Public Citizen's concerns with assurances that they are truthfully advertising the risk and benefits of Celebrex as set forth by the FDA. In late 2007, Pfizer released another US television ad for Celebrex, which also discussed celecoxib's adverse effects in comparison with those of other anti-inflammatory drugs. On March 11, 2009, Scott S. Reuben, former chief of acute pain at Baystate Medical Center, Springfield, Massachusetts, revealed that the data for 21 studies he had authored for the efficacy of the drug (along with others such as Vioxx) had been fabricated. The analgesic effects of the drugs had been exaggerated. Reuben was also a former paid spokesperson for Pfizer. None of the retracted studies was submitted to either the US Food and Drug Administration or the European Union's regulatory agencies prior to the drug's approval. Pfizer issued a public statement declaring, "It is very disappointing to learn about Dr. Scott Reuben's alleged actions. When we decided to support Dr. Reuben's research, he worked for a credible academic medical center and appeared to be a reputable investigator." It is legally available in many jurisdictions as a generic under several brand names. In the US, celecoxib was covered by three patents, two of which expired May 30, 2014, and one of which (US RE44048) was due to expire December 2, 2015. On March 13, 2014, that patent was found to be invalid for double patenting. Upon the patent expiry on May 30, 2014, FDA approved the first versions of celecoxib generic. The use of celecoxib to reduce the risk of colorectal cancer has been investigated, but neither celecoxib nor any other drug is indicated for this use. Small-scale clinical trials in very high-risk people (belonging to FAP families) showed celecoxib can prevent polyp growth. Hence, large-scale randomized clinical trials were undertaken . Results show a 33 to 45% polyp recurrence reduction in people treated with celecoxib each day. However, serious cardiovascular events were significantly more frequent in the celecoxib-treated groups. Aspirin shows a similar (and possibly larger) protective effect, has demonstrated cardioprotective effects and is significantly cheaper, but no head-to-head clinical trials have compared the two drugs. Different from cancer prevention, cancer treatment is focused on the therapy of tumors that have already formed and have established themselves inside the patient. Many studies are going on to determine whether celecoxib might be useful for this latter condition. However, during molecular studies in the laboratory, it became apparent that celecoxib could interact with other intracellular components besides its most famous target, COX-2. The discovery of these additional targets has generated much controversy, and the initial assumption that celecoxib reduces tumor growth primarily by the inhibition of COX-2 became contentious. Additional support for the idea that other targets besides COX-2 are important for celecoxib's anticancer effects has come from studies with chemically modified versions of celecoxib. Several dozen analogs of celecoxib were generated with small alterations in their chemical structures. 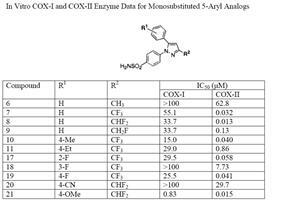 Some of these analogs retained COX-2 inhibitory activity, whereas many others did not. However, when the ability of all these compounds to kill tumor cells in cell culture was investigated, the antitumor potency did not at all depend on whether or not the respective compound could inhibit COX-2, showing the inhibition of COX-2 was not required for the anticancer effects. One of these compounds, 2,5-dimethyl-celecoxib, which entirely lacks the ability to inhibit COX-2, actually displayed stronger anticancer activity than celecoxib. ^ a b c d e McCormack, PL (December 2011). "Celecoxib: a review of its use for symptomatic relief in the treatment of osteoarthritis, rheumatoid arthritis and ankylosing spondylitis.". Drugs 71 (18): 2457–89. ^ a b c d e f g "Drug Label". ^ a b c d Bhala N, Emberson J, Merhi A, Abramson S, Arber N, Baron JA, Bombardier C, Cannon C, Farkouh ME, FitzGerald GA, Goss P, Halls H, Hawk E, Hawkey C, Hennekens C, Hochberg M, Holland LE, Kearney PM, Laine L, Lanas A, Lance P, Laupacis A, Oates J, Patrono C, Schnitzer TJ, Solomon S, Tugwell P, Wilson K, Wittes J, Baigent C (Aug 31, 2013). "Vascular and upper gastrointestinal effects of non-steroidal anti-inflammatory drugs: meta-analyses of individual participant data from randomised trials". Lancet 382 (9894): 769–79. ^ a b "Celexoxib". The American Society of Health-System Pharmacists. Retrieved Jan 2, 2015. ^ Derry S, Moore RA (Mar 14, 2012). Derry, Sheena, ed. "Single dose oral celecoxib for acute postoperative pain in adults". The Cochrane database of systematic reviews 3: CD004233. ^ Yelland MJ, Nikles CJ, McNairn N, Del Mar CB, Schluter PJ, Brown RM (2007). "Celecoxib compared with sustained-release paracetamol for osteoarthritis: a series of n-of-1 trials". Rheumatology 46 (1): 135–40. ^ Zhang W, Moskowitz RW, Nuki G, Abramson S, Altman RD, Arden N, Bierma-Zeinstra S, Brandt KD, Croft P, Doherty M, Dougados M, Hochberg M, Hunter DJ, Kwoh K, Lohmander LS, Tugwell P (September 2007). "OARSI recommendations for the management of hip and knee osteoarthritis, part I: critical appraisal of existing treatment guidelines and systematic review of current research evidence". Osteoarthr. Cartil. 15 (9): 981–1000. ^ Flood J (March 2010). "The role of acetaminophen in the treatment of osteoarthritis". The American journal of managed care. 16 Suppl Management: S48–54. ^ Fan X, Song X (February 2013). "Review: non-steroidal anti-inflammatory drugs may reduce schizophrenia symptom severity in the short term when added to antipsychotics." (PDF). Evidence-Based Mental Health 16 (1): 10. ^ Müller N, Myint AM, Krause D, Weidinger E, Schwarz MJ (April 2013). "Anti-inflammatory treatment in schizophrenia.". Progress in Neuro-Psychopharmacology & Biological Psychiatry 42: 146–53. ^ Na KS, Lee KJ, Lee JS, Cho YS, Jung HY (January 2014). "Efficacy of adjunctive celecoxib treatment for patients with major depressive disorder: a meta-analysis.". Progress in Neuro-Psychopharmacology & Biological Psychiatry 48: 79–85. ^ Rosenblat JD, Cha DS, Mansur RB, McIntyre RS (January 2014). "Inflamed moods: A review of the interactions between inflammation and mood disorders.". Progress in Neuro-Psychopharmacology & Biological Psychiatry 53C: 23–34. ^ Fond G, Hamdani N, Kapczinski F, Boukouaci W, Drancourt N, Dargel A, Oliveira J, Le Guen E, Marlinge E, Tamouza R, Leboyer M (March 2014). "Effectiveness and tolerance of anti-inflammatory drugs' add-on therapy in major mental disorders: a systematic qualitative review.". Acta Psychiatrica Scandinavica 129 (3): 163–79. ^ a b "Celecoxib". The American Society of Health-System Pharmacists. Retrieved Apr 21, 2014. ^ Solomon SD, McMurray JJ, Pfeffer MA, Wittes J, Fowler R, Finn P, Anderson WF, Zauber A, Hawk E, Bertagnolli M (2005). "Cardiovascular risk associated with celecoxib in a clinical trial for colorectal adenoma prevention". The New England Journal of Medicine 352 (11): 1071–1080. ^ a b Antman EM, et al. (Mar 2007). "Use of nonsteroidal antiinflammatory drugs: an update for clinicians: a scientific statement from the American Heart Association" (PDF). Circulation 115 (12): 1634–42. ^ Kimmel SE, Berlin JA, Reilly M, Jaskowiak J, Kishel L, Chittams J, Strom BL (2005). "Patients exposed to rofecoxib and celecoxib have different odds of nonfatal myocardial infarction". Ann. Intern. Med. 142 (3): 157–64. ^ Mukherjee D, Nissen SE, Topol EJ (2001). "Risk of cardiovascular events associated with selective COX-2 inhibitors". JAMA 286 (8): 954–9. ^ Jenkins JK, Seligman PJ. (2005-04-06). "Analysis and recommendations for Agency action regarding nonsteroidal anti-inflammatory drugs and cardiovascular risk [decision memorandum]" (PDF). FDA Center for Drug Evaluation and Research. ^ Chen LC, Ashcroft DM (2006). "Do selective COX-2 inhibitors increase the risk of cerebrovascular events? A meta-analysis of randomized controlled trials". J Clin Pharm Ther 31 (6): 565–76. ^ a b Mathew ST, Devi S G, Prasanth VV, Vinod B (2011). "Efficacy and Safety of COX-2 Inhibitors in the Clinical Management of Arthritis: Mini Review.". ISRN pharmacology 2011: 480291. ^ a b Katzung, edited by Bertram G. (2007). Basic & clinical pharmacology (10th ed.). New York: McGraw-Hill Medical. p. 579. ^ Shi S, Klotz U (Mar 2008). "Clinical use and pharmacological properties of selective COX-2 inhibitors.". European journal of clinical pharmacology 64 (3): 233–52. ^ Conaghan PG (Jun 2012). "A turbulent decade for NSAIDs: update on current concepts of classification, epidemiology, comparative efficacy, and toxicity.". Rheumatology international 32 (6): 1491–502. ^ Bhatt DL, Scheiman J, Abraham NS, Antman EM, Chan FK, Furberg CD, Johnson DA, Mahaffey KW, Quigley EM, Harrington RA, Bates ER, Bridges CR, Eisenberg MJ, Ferrari VA, Hlatky MA, Kaul S, Lindner JR, Moliterno DJ, Mukherjee D, Schofield RS, Rosenson RS, Stein JH, Weitz HH, Wesley DJ (Oct 28, 2008). "ACCF/ACG/AHA 2008 expert consensus document on reducing the gastrointestinal risks of antiplatelet therapy and NSAID use: a report of the American College of Cardiology Foundation Task Force on Clinical Expert Consensus Documents.". Journal of the American College of Cardiology 52 (18): 1502–17. ^ Half E, Arber N (Feb 2009). "Colon cancer: preventive agents and the present status of chemoprevention.". Expert opinion on pharmacotherapy 10 (2): 211–9. ^ Assefnia S, Dakshanamurthy S, Guidry Auvil JM, Hampel C, Anastasiadis PZ, Kallakury B, Uren A, Foley DW, Brown ML, Shapiro L, Brenner M, Haigh D, Byers SW (Mar 2014). "Cadherin-11 in poor prognosis malignancies and rheumatoid arthritis: common target, common therapies.". Oncotarget 5 (6): 1458–74. ^ a b c Penning TD, Talley JJ, Bertenshaw SR, Carter JS, Collins PW, Docter S, Graneto MJ, Lee LF, Malecha JW, Miyashiro JM, Rogers RS, Rogier DJ, Yu SS, Burton EG, Cogburn JN, Gregory SA, Koboldt CM, Perkins WE, Seibert K, Veenhuizen AW, Zhang YY, Isakson PC (1997). 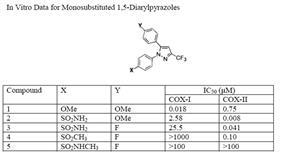 "Synthesis and Biological Evaluation of the 1.5 Diarylpyrazole Class of Cyclooxygenase-2 Inhibitors: Identification of 4-[5-(4-Methylphenyl)-3-(trifluoromethyl)-1H-pyrazole-1-yl]benzenesulfonamide (SC-58634, Celecoxib)". Journal of Medicinal Chemistry 40 (9): 1347–1365. ^ a b Price ML, Jorgensen WL (2001). "Rationale for the observed COX-2/COX-1 selectivity of celecoxib from Monte Carlo simulations". Bioorg. Med. Chem. Lett. 11 (12): 1541–4. ^ Yajnik J (2006-10-27). "University sues Pfizer over COX-2 research". The Scientist. Retrieved 2010-11-11. ^ Linda Thomson (October 28, 2009). "Judge orders Pfizer to pay BYU $852K for suit delays". Deseret News. ^ Tom Harvey (May 1, 2012). "Pfizer, BYU settle Celebrex lawsuit for $450M". The Salt Lake Tribune. ^ Berenson A (April 29, 2006). "Celebrex Ads Are Back, Dire Warnings and All". The New York Times. ^ a b Saul S (April 10, 2007). "Celebrex Commercial, Long and Unconventional, Draws Criticism". The New York Times. ^ Winstein, Keith J. (March 11, 2009). "Top Pain Scientist Fabricated Data in Studies, Hospital Says". The Wall Street Journal. ^ "Mass. doctor accused of faking pain pill data"Associated Press, Mar 11, 2009, . ^ Rial NS, et al. (Aug 2012). "Clinical end points for developing pharmaceuticals to manage patients with a sporadic or genetic risk of colorectal cancer". Expert Rev Gastroenterol Hepatol 6 (4): 507–17. ^ Bertagnolli MM, Eagle CJ, Zauber AG, Redston M, Solomon SD, Kim K, Tang J, Rosenstein RB, Wittes J, Corle D, Hess TM, Woloj GM, Boisserie F, Anderson WF, Viner JL, Bagheri D, Burn J, Chung DC, Dewar T, Foley TR, Hoffman N, Macrae F, Pruitt RE, Saltzman JR, Salzberg B, Sylwestrowicz T, Gordon GB, Hawk ET (August 2006). "Celecoxib for the prevention of sporadic colorectal adenomas". ^ Baron JA, Cole BF, Sandler RS, Haile RW, Ahnen D, Bresalier R, McKeown-Eyssen G, Summers RW, Rothstein R, Burke CA, Snover DC, Church TR, Allen JI, Beach M, Beck GJ, Bond JH, Byers T, Greenberg ER, Mandel JS, Marcon N, Mott LA, Pearson L, Saibil F, van Stolk RU (2003). "A randomized trial of aspirin to prevent colorectal adenomas". ^ Sandler RS, Halabi S, Baron JA, Budinger S, Paskett E, Keresztes R, Petrelli N, Pipas JM, Karp DD, Loprinzi CL, Steinbach G, Schilsky R (2003). "A randomized trial of aspirin to prevent colorectal adenomas in patients with previous colorectal cancer". ^ Bosetti C, Talamini R, Franceschi S, Negri E, Garavello W, La Vecchia C (2003). "Aspirin use and cancers of the upper aerodigestive tract". ^ Dannenberg AJ, Subbaramaiah K (December 2003). "Targeting cyclooxygenase-2 in human neoplasia: rationale and promise". ^ Schönthal AH (December 2007). "Direct non-cyclooxygenase-2 targets of celecoxib and their potential relevance for cancer therapy". Br. J. Cancer 97 (11): 1465–8. ^ Chuang HC, Kardosh A, Gaffney KJ, Petasis NA, Schönthal AH (2008). "COX-2 inhibition is neither necessary nor sufficient for celecoxib to suppress tumor cell proliferation and focus formation in vitro". Molecular Cancer 7 (1): 38. ^ a b Zhu J, Song X, Lin HP, Young DC, Yan S, Marquez VE, Chen CS (December 2002). "Using cyclooxygenase-2 inhibitors as molecular platforms to develop a new class of apoptosis-inducing agents" (PDF). Journal of the National Cancer Institute 94 (23): 1745–57. ^ Schönthal AH, Chen TC, Hofman FM, Louie SG, Petasis NA (February 2008). "Celecoxib analogs that lack COX-2 inhibitory function: preclinical development of novel anticancer drugs". ^ Schönthal AH (2006). "Antitumor properties of dimethyl-celecoxib, a derivative of celecoxib that does not inhibit cyclooxygenase-2: implications for glioma therapy". Neurosurgical Focus 20 (4): E21.